Engineered for function and styled for good looks, triple chrome-plated Signature Series valve covers have stock-style breather baffles that prevent oil passage to the PCV valve. These quality valve covers accept all emissions equipment, including PCV valve. Rubber grommets for the breather and PCV valve holes included. Matching breathers sold separately. NOTE: Tall Profile are 1-1/4” taller than stock, and clear most roller rockers and valvetrain components. Low Profile valve covers clear air-conditioning and alternator brackets. Tall profile valve covers will not clear stud girdles. Signature Series valve covers clear most aluminum rocker arms and moderate lift cams. Check clearance prior to purchase. These heavy-gauge, die-cast aluminum valve covers come with a handsome, polished finish for a custom look. The raised fins are accented by a black matte background, then detailed with Allen hex heads that create a two-piece look from a one-piece construction. We have two styles, one with the Edelbrock name and one without. The “No Name” valve covers offer the distinctive look of the original Elite line, but with no Edelbrock name. Our Tall Profile Valve Covers will clear most roller rockers and valvetrain components. Our Low Profile valve covers clear all air-conditioning, alternator brackets and aluminum rockers. The number in parentheses is the dimension from the gasket flange edge to the top of the valve cover. Dimensions accurate within 1/8”. Edelbrock first made these aluminum valve covers in the late ‘50s and they’re still a classic. Made of heavy-gauge sand-cast aluminum, our classic finned valve covers are available in either a classicpolished aluminum or durable black powder coated finish. Overall height is measured from base to top at the highest point. 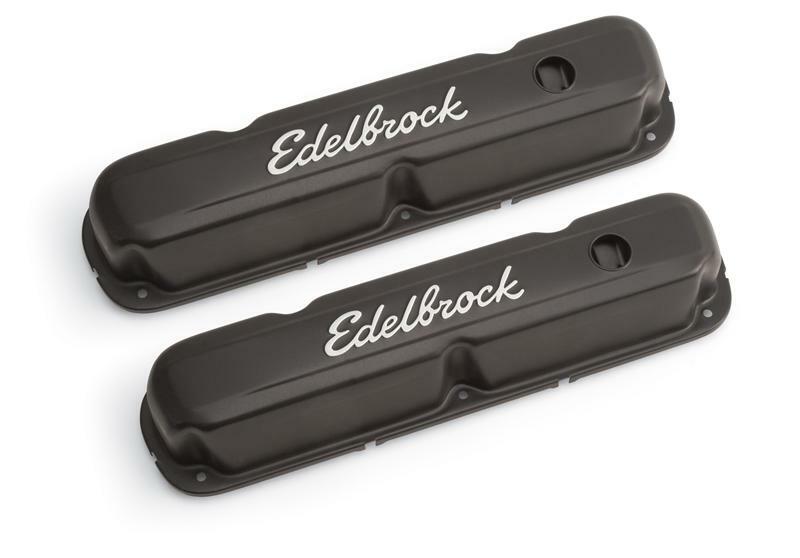 Edelbrock classic valve covers can be machined to accept breathers if desired. Our Victor Series valve covers have a black powder coated finish that features a finely textured surface for a pleasing and unique appearance. This is the same finish you’ll find on our top-of-the-line Edelbrock/Musi 555 Crate Engine. These valve covers are manufactured from die-cast aluminum and machined with 1-1/4” breather hole. Overall height is measured from base to top at the highest point. Lightweight, high-strength sand or die-cast aluminum valve covers provide ample clearance for all popular valvetrains on all cylinder heads. They include gasket retaining tabs for positive retention. They have no oil breather holes and will require custom plumbing for crankcase ventilation. Edelbrock aluminum racing valve covers are available in two finishes – polished, black powder-coated and with or without the Edelbrock logo.